Chamber Choir of Tallinn University of Technology and Sigulda mixed choir Altvars invite you to our Spring Concert! The concert will take place on Saturday the 16 of March in Hopners House from 19:00. 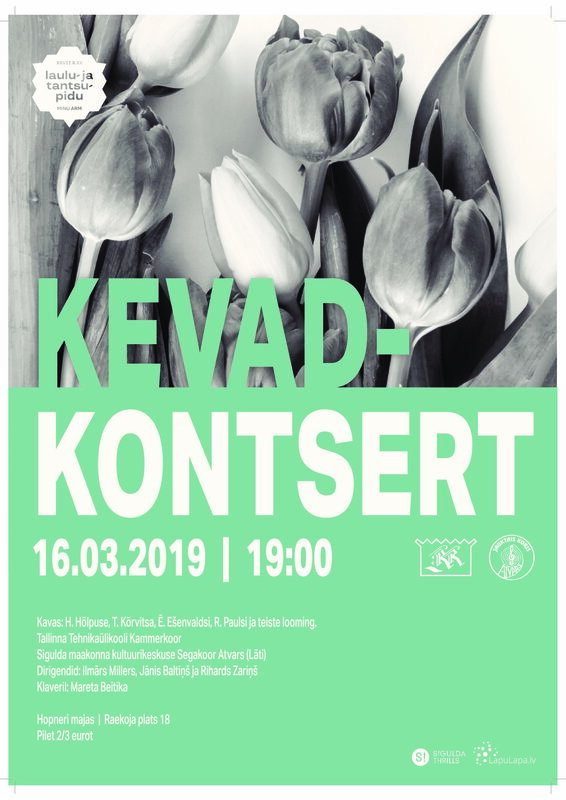 We will be beforming songs from H. Hõlpus, T. Kõrvits, E. Ešenvalds, R. Pauls and many more! Conductors Ilmārs Millers, Jāniš Baltiņš ja Rihards Zariņš. On piano Mareta Beitika. Tickets are available on site. Ticket 2/3 €. There is no ticket, but you can donate to the church. Soon there will be a very important day Chamber Choir birthday. The choir will be a year older and also a year smarter. In this years concert there will be songs performed by the entire choir and some individual performances as well. We hope to see our alumnus and friends in Glehn castle on the 11th December at 19:00. Chamber Choir of Tallinn University of Technology is waiting new members to join and sing with us. Visit our open rehearsals on 4th and 6th of September and come to sing with us. Our rehearsals are totally in English, cause our conductors are both Latvian. We are waiting You 4th or 6th of September in TTU U06-229 at 6.30 p.m!